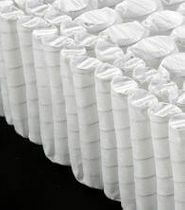 Featuring over 1130 individually wrapped high strength coils with double edge support and lumbar support under a 3" Natural Talalay or Natural Dunlop topper. There are actually 3 wire gauges in the QE Combi-Zone®. 16g narrow diameter perimeter coils. 17g narrow diameter coils through center 1/3 and 14g larger diameter coils on both sides of center 1/3. Now offering Slow Recovery Latex for those who like the memory foam feel but with none the off gassing and chemicals. 3" toppers come in Plush #20-24 ILD, Medium #25-29 ILD, and Firm #30-34 ILD. Slow Recovery Latex option is #20-24 ILD. Also available are dual firmness toppers where you can specify 2 different ILD's for left side and right side. To do this just choose one or the other firmness choice and then when checking out use the COMMENT SECTION to write "Please make this topper half (ild) and half (ILD)" As an example "Please make topper half plush talalay and half medium talalay". There is no extra charge to do this. This mattress finishes a little over 12" thick.